Waiting for a better mousetrap? 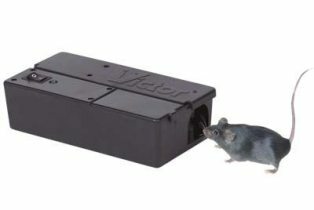 Here it is, an electronic mousetrap that quickly and humanely kills mice with a high-voltage charge. No poisons, sticky messes or snapped fingers. You never touch a dead mouse; simply open the lid and dispose of dead rodent. Green indicator light blinks for 24 hours when activity is detected. Safe for use around pets and children. Requires 4 AA batteries (not included).